Gallery of cosmetic make-up and false emotional looks. If woman masks original emotions and creates void emotional image, and in essence creates false facial looks by means of cosmetic make-up, then in any case her false disguised physiognomy is obvious for associate men. 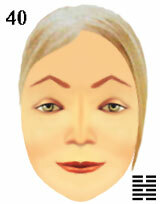 The open eyebrows seem cheerful as eyes and mouth express joyful emotions. Joyful eyes and mouth seem cordial as eyebrows express open emotions. Ideas are exciting as desires are satisfied by pleasant feelings. Joyful sensations raise arising desires that is the reason for excitement of thoughts. false emotional looks and masks of original emotions.